We appreciate your tax-deductible donation, which will help support the continued growth and development of ClotCare Online Resource. Simply click the button below to make a donation online using your credit card or PayPal account, or if you prefer, you may mail donations to the address below. If you donate online, you will be able to print a receipt for tax purposes. For mailed donations, please provide us with a return address, and we will mail you a receipt. ClotCare is a 501(c)(3) charitable non-profit organization. For more information about ClotCare, see our "About Us" page. We appreciate your donation and would like to acknowledge you as a donor on our website. If you would prefer not to be acknowledged, please let us know by using the comments field when donating online or by including a note with your mailed donation. Also, please let us know if you would like to make the donation in honor or in memory of a loved one. 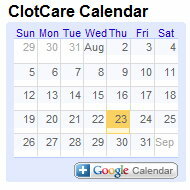 Questions or concerns may be directed to webmaster@clotcare.org.